What I always hope is an interview grows organically and in this case it did. I went into this interview with inker and artist Bruce McCorkindale thinking we would discuss one thing when in fact I discovered he’d been an inker for Malibu for a number of years and I launched a whole separate discussion before all is said and done. We of course got around to also discussing his upcoming graphic novel The Falling Man. My thanks to Bruce for his time. Tim O’Shea: How did you start inking in the first place? Bruce McCorkindale: I pretty much knew I wanted to work in comics since age 9, so I spent a lot of time practicing. My first published work was an adaptation of H.P. Lovecraft’s “The Festival” for New Media Irjax’s FANTASY ILLUSTRATED way back in ’84. The editor told me that the company went out of business before it saw print, but it turns out that it squeaked through! However, I didn’t find this out ’til about 15 years later! Around the same time, I went to a lot of comic cons, and got a lot of good response to my inking samples. Thus, I focused on inks, and got my first steady work from Malibu Comics in late 80s. They kept me busy for a good 10 years or so! These days, the most challenging aspect of my work is finding time and energy to focus on creator-owned works. That’s really the most satisfying aspect of comics creation, but it’s not the most profitable. So, I divide my time between doing inking work, re-creations of classic comic covers, advertising/editorial work, and try to sneak in my own work whenever I can. Aside from finding time for this work, the other challenging aspect is trying to grow and improve. I never think I’m good enough, and I think I’m right! Has there ever been one you could not successfully finish? I’ve always been able to finish out comics work assigned to me. In terms of my own works, there are quite a few unfinished ones. However, I’m an absurdly patient guy (probably to a fault), and never give up on the ones I believe in. I’m currently working here and there on projects that have been in the works a long time…like, a decade long! What do you find to be the most creatively satisfying aspect of the experience. The most satisfying aspect is when I finish a piece of work that I’m really happy about (rare) and that other people enjoy as well. Those two things often happen, but not always at the same time! I also like when I tackle something I really think I can’t handle, and pull it off. That’s a great feeling. My biggest influences, in order of appearance, are Dr. Seuss, Charles Schulz, Marvel comics from the 1960s-70s, and Bernie Wrightson. In the 80s, THE COMICS JOURNAL was a big influence in terms of exposing me to a lot of different creators trying to push the envelope in comics storytelling. A lot of great folks worked with Malibu. Were there certain creators that stuck out from that era in terms of creators you inked? My first gig with Malibu was TWILIGHT AVENGER, inking Terry Tidwell. Years later, Terry and I worked together in an illustration studio doing comic-style artwork for the editorial/advertising market, and we even did some animation work. We still keep in touch, and do freelance work together! I inked a lot of guys at Malibu – some of my favorites were Leonard Kirk, Mitch Byrd, and Gabriel Gecko (Hardman). A particularly fun job was inking a short DINOSAURS FOR HIRE story by Curt Swan. Curt’s Superman books were probably some the very first comics I ever read, so that felt very special. I met Curt at an Iowa con not long after the book came out, and he was extremely nice. He said a lot of newer guys weren’t very faithful to his pencils, and he appreciated the work I did. That meant a lot. I am curious to learn more about in ways Bernie Wrightson influenced you. Also could you please give examples of The Comic Journal talent you found of worth. I just fell in love with Bernie’s artwork right away. I went through a phase in the mid 70s where I was a little discouraged with mainstream comics, and Bernie’s work on SWAMP THING and in Warren magazines like CREEPY and EERIE just felt like a breath of fresh air. His illustration style was immaculate, but he also had a great sense of storytelling – a quality that I’m not sure he always gets as much credit for. THE COMICS JOURNAL exposed me to a the burgeoning indie scene that was happening in the mid-to-late 80s. That’s how I found out about people like the Hernandez bros., Daniel Clowes, and Art Spiegelman’s RAW magazine. 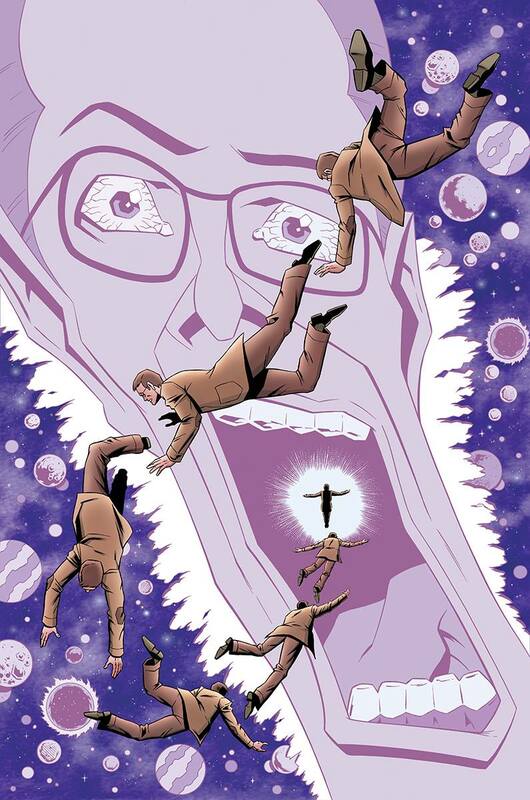 What can you tell folks about your Original Graphic Novel, THE FALLING MAN. For the past few years, I’ve been doing a complete re-vamp of my graphic novel THE FALLING MAN. This is a book that I wrote and illustrated, with Phil Hester doing layouts. The book has has a complicated history. Back in 1997, it was planned as a 4-issue series for Jim Valentino’s Shadowline division of Image Comics. They put out one issue, then decided they didn’t want to take a chance on the other 3. The sales were actually pretty good for a somewhat unconventional indie (around 4500, I believe), but this was also around the time when the market, in general, was having an implosion. I eventually put the entire thing together as a single graphic novel for Caliber Comics in 1999, but wasn’t happy with the work I did. Around 2012, I decided that the only things I liked from the original were the script and Phil’s layouts, so I decided to take on the daunting task of re-pencilng/inking the entire thing, and adding color. As much as I love pure black and white art, this particular project really needs color to work. It has kind of an existential WIZARD OF OZ vibe, and color is a necessary element. I’m having to fit the work in between paying gigs, but my main goal is to not rush it, and do the best work I can. I’ve put a couple feelers out about it, but I’m really not even worrying about a publisher at this point. My hope is to finish up the entire book, and then think about where it should (or could) go. I have a few other brand-new projects I’m playing with too, but I feel like I need to get THE FALLING MAN out of my system first. I’m hoping to finally have closure with it sometime next year. While brief what was it like to work with Hester? Actually, Phil’s another guy I’ve kept in touch with for a long time, now! We’ve done a lot of work together. Our first team-up was on a story for DC’s BLACK ORCHID ANNUAL #1. I’ve also inked him on THE WRETCH, THE NAMELESS, FOOT SOLDIERS, and FOUR LETTER WORLDS. Most recently, I inked Phil on IDW’s GODZILLA: KINGDOM OF MONSTERS. I also did the inks and colors on a number of his covers for Dynamite’s GREEN HORNET series. He’s a phenomenal artist and storyteller, and very easy to work with. We have very similar sensiibilites, and get along great.